1. Park the vehicle on a level surface and chock the rear wheels. 2. Jack up the front of the vehicle. Place jack stands under the frame rails and lower onto jack stands letting the front suspension hang. 3. Remove the tires and wheels. Remove the upper and lower factory skid plates using a 15mm wrench. Retain factory hardware and front skid plate for reuse. 4. Using a 21mm wrench, remove the tie-rod nut as shown in Photo 1. Strike the side of the mount to dislodge the tie rod end. Remove from the knuckle. 5. Remove the sensor wire from the plastic clip. Remove the bracket from the control arm using a 10mm wrench. See Photo 2. 6. Remove and unplug the ABS sensor wire from the frame as shown in Photo 3 and remove the two bolts holding brake caliper to the factory knuckle using a 18mm wrench. Remove the caliper assembly from the knuckle and hang securely out of the way. Do not hang the caliper by the brake hose. 7. Using a 18mm wrench, remove the upper strut nuts as shown in Photo 4. Retain factory hardware for reuse. 8. Using a 15mm wrench, remove the 2 bolts securing the lower strut as shown in Photo 5, to the lower control arm and remove the strut from the vehicle. Remove and discard the factory lower retainer clips. New hardware will be used. 9. 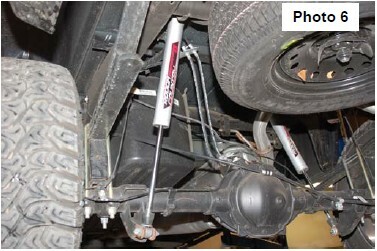 Remove the sway bar & end links from the lower control arm as shown in Photo 6 using a 15mm wrench. 10. 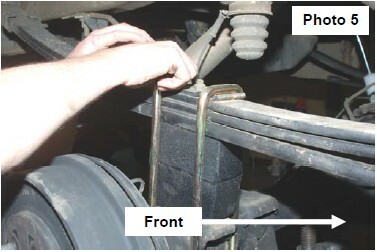 Remove the sway bar from the frame as shown in Photo 7 using a 10mm wrench. Retain all hardware for reuse. 11. Using a 15mm wrench, remove the 6 axle shaft bolts from the differential and remove from the knuckle. Repeat on opposite side. 12. Remove the upper and lower ball joint from knuckle using a 18mm wrench and 24mm on the lower. Upper shown in Photo 8. Strike the knuckle as shown to dislodge the ball joint. Separate the upper control and lower control arm from the knuckle and remove the knuckle and the lower control arms from the vehicle. 13. Remove the four rear cross member bolts and remove the rear cross member brace as shown in Photo 9 using a 18mm wrench. 14. Trim the lower control arm mount on the frame as shown in Photo 10. Trim only enough to allow for installation of new front RCX cross member. 15. Install the front cross member as shown in Photo 11 with the supplied 16mm x 120mm bolts, nuts /washers. Do not tighten at this time. 16. Install the rear cross member in the factory location using the supplied 16mm x 130mm bolts, nuts/ washers as shown in Photo 12. Do not tighten at this time. 17. Reinstall the lower control arms in the cross member brackets with the factory hardware. Do not tighten at this time. 18. Tighten the cross member bolts using a 24mm socket & wrench. 19. Install the supplied 3/8” studs on the strut spacer using 9/16” wrench & 3/8” nuts to lock the stud in place. See Photo 13. The stud should clinch with about 35-45 ft/lbs of torque. Do not over torque the nut. 20. Install the strut spacer on top of the strut as shown in Photo 14 with the stock hardware. Tighten using a 18mm wrench. 21. Install the strut in the upper strut tower using the supplied 3/8” nuts, washers & lock washers. Tighten using a 9/16” wrench. 22. Install the lower part of the strut in the factory location on the lower control arm with the supplied 10mm x 55mm bolts, nuts /washers. Tighten using a 17mm” wrench. 23. On the factory knuckles, remove the bearing assembly using a 15mm wrench and install in the new knuckle. Tighten hardware. See Photo 15. 24. Install the knuckles on the lower ball joint with the factory hardware. Tighten using a 18mm wrench. 25. Trim tie rod ends as per instructions on last page and install on the knuckle. Tighten using a 21mm wrench. 26. Install the sway bar drop brackets with the 10mm x 35mm bolts, locking washers & flat washers using a 17mm wrench. Tighten hardware. See Photo 16. 27. Install the sway bar on the sway bar drop brackets with the stock bolts and supplied 10mm nuts & washers. Tighten using a 17mm wrench. See Photo 17. 28. Using the supplied template on last page of instructions as a guide, mark and drill the lower control arm using a 11/16” drill bit to relocate the sway bar end link. See Photo 18. After drilling, install the sway bar end link with the stock hardware and tighten. 28. 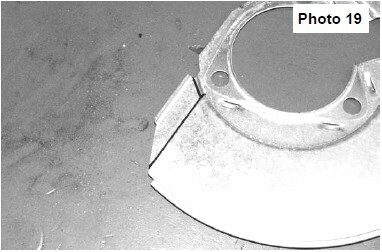 The brake shroud must be trimmed to allow the caliper to reinstalled, Mark the dust shroud as shown in Photo 19 and trim. Reinstall the brake caliper on the knuckle with the factory hardware and tighten. 29. Remove the brake line bracket from the upper control arm mount as shown in Photo 20 using a 13mm wrench. 30. Install the supplied brake line relocation bracket on the upper control arm mount with the stock hardware. Slightly pull down on the brake line assembly and reinstall on the drop bracket with the supplied 5/16” x 3/4” bolts, nuts / washers using a 7/16 wrench. See Photo 21. Reconnect the ABS wire that was disconnected in Step 6. 31. Remove the brake line clip from the brake line using a flat head screw driver as shown in Photo 22 and trim as shown in Photo 23 Reinstall the modified bracket on the stock control arm with the stock hardware. 32. If the optional kicker bars were purchased with this kit, install at this time per the instructions included with that kit. 33. Reinstall the factory upper skid plate with the factory hardware. 34. Install the tires and wheels. Jack up the front of the vehicle and remove the jack stands. 35. Lower the vehicle to the ground. 1. Chock the front tires. 2. Before jacking up the rear of the vehicle. Remove the stock brake line bracket using a 13mm wrench, from the driver side frame rail to allow the extension bracket to be installed. See Photo 1. The stock bolts can be accessed from the side of the vehicle. Retain the stock hardware for reuse. 3. Install the brake line bracket to the new bracket with the supplied 5/16” x 3/4” bolts, nuts /washers. Reinstall the assembly in the stock location with the stock hardware using a 13mm wrench. See Photo 2. 4. Remove the e-brake cable from the mount as shown in Photo 3. This will require a screw driver to bend open mounting loop. 5. Remove the ABS wire, if equipped, from the frame rail as shown in Photo 4 to allow slack in the line. 6. Jack up the rear of the vehicle and place jack stands under the frame rails. Remove tire and wheels. 7. Lightly support the differential with a floor jack . 8. Remove the stock shock absorbers using a 21mm wrench. Retain the hardware for reuse. 9. Remove the stock u-bolts and lower the axle to allow the supplied block to be installed. Discard the factory block if so equipped. 10. Install the new block on the axle. Jack up the axle and make sure the center pin is aligned with the block. See Photo 5. Note short side of block goes towards front of vehicle. 11. Install the supplied u-bolts and tighten using a 22mm wrench and a crossing pattern. 12. Insert bushings into RCX 2.2 series shock eye, then install sleeve into bushings. The use of dish soap to lubricate bushing makes this process easier. 13. Install the supplied Rough Country 2.2 Series Performance Shock Absorbers in the factory location with factory hardware. Tighten using a 21mm wrench. See Photo 6. 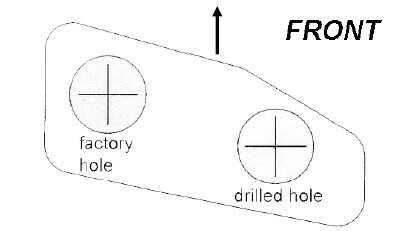 Note that these shocks are designed to run piston down as shown. 14. Reconnect the ABS lines to the plastic retaining clip at the bottom of each frame rail. The connector will not be reattached to the top of the frame. Reroute the lines as needed to gain proper slack. 15. Re-install tires and wheels. 16. Remove jack stands and lower vehicle to ground. 17. Place shock decals on shock absorbers and window decal on vehicle. Cut out template and position template on lower control arm as shown in Step 45.. Drill with a 11/16 drill bit and relocate the sway bar end links into the new location. INSTRUCTIONS FOR TRIMMING TIE ROD ENDS. 2. Measure over 3/8” and mark. 3. Cut the tie rods / tie rod sleeves as shown below to allow the vehicle to be realigned. 4. Smooth any rough edges. 1. Check all fasteners for proper torque. Check to ensure for adequate clearance between all rotating, mobile, fixed, and heated members. Verify clearance between exhaust and brake lines, fuel lines, fuel tank, floor boards and wiring harness. Check steering gear for clearance. Test and inspect brake system. 2. Perform steering sweep to ensure front brake hoses have adequate slack and do not contact any rotating, mobile or heated members. Inspect rear brake hoses at full extension for adequate slack. Failure to perform hose check/ replacement may result in component failure. 3. On some vehicles the front lower skirting will need to be trimmed if using certain wheel /tire combinations and with heavy offset wheels. Trim only as needed. Important note: For alignment purposes, please refer to the instructions above. The inner & outer tie rod ends may need to be trimmed to allow the front end alignment to be set properly. Please alert your alignment specialist of this possibility. 6. Perform head light check and adjustment to proper settings and Check and retighten wheels at 500 miles. 7. All kit components must be retightened at 500 miles and then every three thousand miles after installation. Periodically check all hardware for tightness. Note: Installation of larger tires will require speedometer recalibration.